London’s most resident-friendly production for 2016 was, without question, ITV’s thriller series, Unforgotten 2, which started last Thursday (January 5) to rave reviews. Making donations to resident groups across London throughout the shoot, and using low-impact techniques to film, the nimble production shot on location across Camden, Islington, Southwark, Haringey and Lambeth over the summer. Take a look at the trailer here. FilmFixer manages the film office service for these boroughs. FilmFixer director Karen Everett says, “The approach that Unforgotten 2 took with this series really warrants praise. “The first series production was exemplary in its approach to residents, thanking Londoners at the time for making their neighbourhoods accessible to filming. “This time around, while working hard to reduce any impact, the production made donations to no less than 12 resident associations – ensuring all locals might benefit from the filming they’d hosted. “This is the approach that keeps London open to the film business. “Donations contribute to events and projects supporting cohesive communities – the best legacy we believe the film and TV industry can thank Londoners with. Street parties, improving public gardens and restoring public spaces all help to bring locals together, thanks to resident group donations. Patricia Wager, who chairs the Red Lion Tenants & Residents Association in Camden adds, “We are very appreciative of the donations made. They help us carry out much needed improvements to our Tenants Hall. They are also put towards social events, such as a lunch for older residents – inviting them to share memories of the area. “We also split donations with the newly formed Friends of the Red Lion Square Garden, which has been set up to improve this important amenity in the area. It was after shooting at the The Enterprise Pub on Red Lion Street, that the production made donations to the Red Lion Tenants & Residents Association and Friends of Red Lion Square Garden. Also in Camden, around the Hatton Garden area, Greville Street sees the detectives visiting jewellers and a watch repair shop in Leather Lane market. And a guild building is visited on Queen Square for a police interview. On filming a witness interview in Camden Square, a donation was left with the Camden Square Tenants and Residents Association. Somerton House Residents Association along with Woburn Walk Business & Residents Association benefitted from scenes where our detectives head along Woburn Walk and into a spa on Dukes Road, looking for witnesses. We find a suspect’s former home is now a modern advertising agency on Flaxman Terrace. On Tottenham Court Road, an electronics shop is visited for specialist advice about a clue. And yet another possible witness lives on the Regents Park Housing Estate on Robert Street. In Southwark, Sampson House, where Hopton Street is dressed as a hospital, donations were made to the Bankside Residents’ Forum and Hopton Street Charity. A character makes a phone call outside his workshop on Tanner Street. There’s an estate agent featured on Bermondsey Street and a temp agency on Borough High Street. One character’s family home is on Trinity Church Square, where the local residents association received a donation. In Haringey, a suspect’s relative lives in Broadlands Road and more possible suspects are found in Priory Gardens. In Islington’s Myddleton Square, the action was all filmed from inside a car driving around the square. And a donation went to the Myddleton Square Association. And in Lambeth, a home on Whittlesey Street features, which led to donations to Hatch Row Co-operative, Lambeth Estate Residents’ Association and Edward Henry House Co-operative. 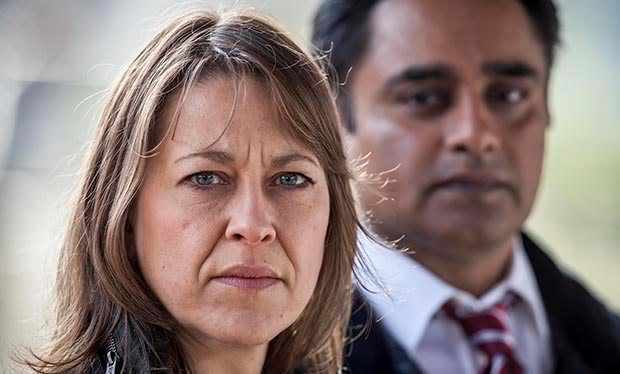 The six-part series created by Chris Lang starts at 9pm on Thursday January 5th, staring once again Nicola Walker and Sanjeev Bhaskar. This time around a dead man is found in a suitcase by the River Lea. He’d disappeared in 1990, leaving a wife, who has since remarried, and a son.